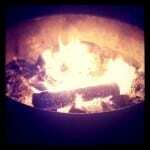 Recently, a reader requested an article on family-friendly Washington campgrounds. You ask and I deliver! 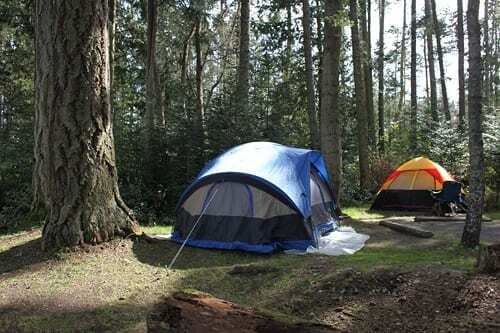 I pestered the Washington State Parks Department for insider hints and tips on finding great Washington State kid-friendly campgrounds. Here’s our Q & A with Linda Burnett of the Washington State Parks. Please note, these are car-camping sites. Q: Are there any unique family-friendly features at Washington State campgrounds? Burnett: We have several parks that offer a Junior Ranger Program in the summer. Junior Ranger Programs include campfire stories, beach walks, nature walks, art activities and wildlife talks. The Junior Ranger Program is an interactive activity between park staff, volunteers and visitors. Kids have fun and learn to be good park stewards in the process. Activities and awards are the central feature of the program. The Junior Ranger Program is for kids as well as parents and guardians. Q: Can you suggest a destination near Seattle that would be a great choice when camping with kids? Within a 90-minute drive of Seattle, Cama Beach offers day and overnight visitors alike a “time capsule” experience. The historic fishing resort was a favorite summer getaway for families for more than 50 years. The area, used for centuries by Native Americans for fishing and hunting, looks out on sweeping views of the Sound, with Whidbey Island and the Olympic Mountains beyond. 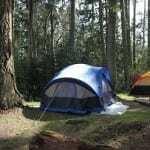 Camano Island State Park is a short drive from Cama Beach for the families that prefer camping. It is connected by a mile-long trail to Cama Beach. Both parks are open for day use or overnight stays year round. This is a first-come, first-serve park. Both parks offer an active Junior Ranger Program. Q: Can you suggest a family campground along the Washington Coast? A wonderful kid and family friendly park on the Washington Coast is Cape Disappointment State Park. Don’t let the name fool you, this park is anything but a disappointment. This park is a 1,882-acre camping park on the Long Beach Peninsula, fronted by the Pacific Ocean. 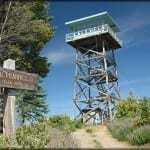 The park offers two miles of ocean beach, two lighthouses, an interpretive center and hiking trails. Visitors enjoy beachcombing and exploring the area’s rich natural and cultural history. The nearby coastal towns of Ilwaco and Long Beach feature special events and festivals spring through fall. The park has old-growth forest, lakes, freshwater and saltwater marshes, as well as streams and tidelands along the ocean. Three vacation house rentals are available. Interpretive opportunities include the Lewis and Clark Interpretive Center tells the story of Lewis and Clark on their journey from St. Louis to the Pacific Ocean. The North Head Lighthouse is also open to visitors (tours cost $2.50 per adult, free ages 7 to 17). Call the center at (360) 642-3029 for hours and tour information. Other interpretive opportunities, such as the Fort Columbia Interpretive Center and the Fort Columbia Commanding Officer’s House Museum, also are in the vicinity. Campsite and vacation house reservations can be made online www.parks.wa.gov or by calling (888) CAMPOUT. Q: There are no guarantees, but is there a location known as a calm, mellow Washington campground? Twanoh State Park, situated on the shoreline of Hood Canal, features one of the warmest saltwater beaches in Washington state. This is because Hood Canal is one of the warmest saltwater bodies in Puget Sound. The 182-acre marine, camping park has 3,167 feet of saltwater shoreline. The name of the park derives from the Native American Twana tribes, better known as the Skokomish, who made their home in the area. Twanoh is popular for shellfish harvesting. Oyster beds are seeded annually, providing for ample harvests. Clam season usually is open from Aug. 1 through Sept. 30 each year, while the park is open to oyster harvesting year round. Visitors also enjoy other recreational activities, including hiking, fishing, swimming, water skiing, wildlife viewing and the kids will enjoy the Junior Ranger program offered every weekend in the summer. This is a first-come, first serve park, an the park offers a Junior Ranger Program every weekend throughout the summer. Q: When all campgrounds are booked on popular weekends, where’s an overlooked Washington State campground, still typically offering spots? Where can families go when it seems like nothing is left? Q: Any other favorite family campgrounds along a lake or on one of Washington’s islands? Battle Ground Lake State Park is a beautiful camping park that lies in the foothills of the Cascade Mountains in Southwest Washington. The lake’s origin is volcanic and is believed to be a caldera, a basin formed when the cone of a volcano collapses. This 280-acre camping park is popular with anglers with its spring-fed lake that is stocked annually with rainbow trout for fishing. Other fish found in the lake include cutthroat trout, small-mouth bass and catfish. Visitors may explore ten miles of roads and trails, including a self-guided interpretive trail. The park also offers a variety of recreational activities including horseback riding, boating, swimming and scuba diving. Another smaller quieter park that offers 25 standard campsites, six hookup sites that accommodate RVs up to 35 feet long and 15 primitive campsites. Campers using the primitive campsites should be prepared to walk a quarter-mile to a half-mile to the campsites. An interpretive program is offered every Saturday from mid-June through Labor Day. This evening program includes night sky interpretation with a telescope, slide shows and guest speakers. There is a self-guided nature trail in the park. Reservations for individual campsites and cabins may be made online at www.parks.wa.gov or by calling (888) CAMPOUT or (888) 226-7688. Check out the cool park-finder form and the map of Washington State campgrounds, read about camping sites with kids in Oregon, tips for camping with babies and young children, and camping with kids in BC. Readers, do you have a favorite family-friendly camping spot in Washington State? Care to share your secret? Leave it below! Brand new! Western Washington State Campgrounds with Playgrounds. This article is just what I needed to see today. You always seem to do that. Are you powers of clairvoyance finely tuned? I’m thinking of taking my son on a camping trip to foster some dependence on me and soothe the wounds of a missed family trip to New England. There is so much of the state we haven’t explored, and we’ve never had a bad trip. There are tons of great ideas here. Thanks! Our favorite campground is Spencer Spit on Lopez Island. 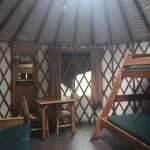 The campsites are very roomy and the dense wooded property offers lots of privacy from neighboring sites. There is a small playground next to the bathroom building, but that isn’t a big priority for me when I’m going camping. I want to pretend I’ve hiked in miles from the road, and have my car packed with iced beer and safely chilled bratwurst in the trunk. Spencer Spit delivers the illusion, plus it has amazing sandy beaches. The walk down to the beach was long enough that I didn’t want to be going back and forth several times, so we packed for the day and just hunkered down until we were ready to return to the campsite. For the truly adventurous, there are campsites on the beach. These offered little privacy and are adjacent to a marshy tideland that smelled of ripe tidal flats and seemed to be full of sand fleas and mosquitoes. Camping in the woods was a better option for our family, but I know lots of people who love to be close to nature and far from the road. Junior ranger program sounds great. Any idea how to find out where they are offered? Jeannine, unfortunately, at this point there isn’t a way to look up which parks offer programs or playgrounds. That will hopefully be something offered in the next year or so. Wouldn’t it be great? I love the direction of this article. We are campers and are just starting to explore the State Parks. We were at Birch Bay (just south of Blaine) this past weekend. Tons of kids riding bikes, my 2 & 5 year olds had a blast. Lots of flat roads for biking, the beach was an OK beach by PNW standards, and there is a waterslide/park nearby in the town. A sweet 1/2 mile interpretive trail, but no other hikes in the park. As you mention above would love to be able to search by certain amenities like playgrounds, etc. -What to say to people playing their radio in the neighboring campsite before 10pm, so technically OK as it isn’t quiet hours yet. But you have a kid trying to sleep. -This is more of a general dilemma, but traveling/camping with your potty-training child. I am a park ranger at Twanoh State Park and I happened upon this post. Typically, you can call the park office to find out the Junior Ranger program schedule, or if there isn’t a program scheduled, you can ask if the Ranger will provide a Junior Ranger program to your children or for a small group – I know that I have done that many times in the past. The phone number at Twanoh State Park is 360-275-2222. Also – I saw the question regarding camping dilemmas (i.e. radio playing before 10pm). Technically, the Peace and Quiet WAC (352-32-056) states, “No person shall, at any time, use sound-emitting electronic equiment including eletrical speakers, radios, phonographs, televisions, or other such equipment, at a volume which emits sound beyond the person’s vehicle or immediate area of use, individual camp or picnic site that my disturb other park users without specific permission of the park ranger”. In this particular instance, I would recommend not making the contact yourself – contact a campground host, a park aide, or a Park Ranger. Then, the ranger can make the contact. When I make contacts like this I do so in a manner where it is not known than somebody reported the noise, i.e. I walk through the area and “just so happen” to notice that the radio is emitting sound beyond the area of the campsite in question. Then, I will ask the camper to turn down/off the music. It usually goes very well, and then there is no camper-camper tension or awkwardness. Twanoh State Park is first come, first serve during the summer. The best day to show up is to come on a Sunday when everybody is leaving, however, if that isn’t possible, then the earlier the better during the rest of the week. At a first come first serve site, you must actively occupy your campsite on the day that you arrive (i.e. you can’t set up a tent and pay for the site on a Tuesday and then show up on Friday for your camping weekend). Calling ahead is also helpful, as you can talk to somebody and get an idea of how full the park is. I hope that has helped everybody. Thanks for your input, Stacy. I’m surprised that Lincoln Rock park isn’t mentioned here. We just got back from our first camping trip there and it was fantastic. We have 4 yr old and one year old who is still crawling – the campsites are all grassy, there is an enormous playground, lake/beach area for kids to play. I’d really recommend it for anyone camping with small children. Thanks for the tip, Liz. Here’s the link, readers: http://www.parks.wa.gov/parks/?selectedpark=Lincoln%20Rock and the park is located in Central Washington.